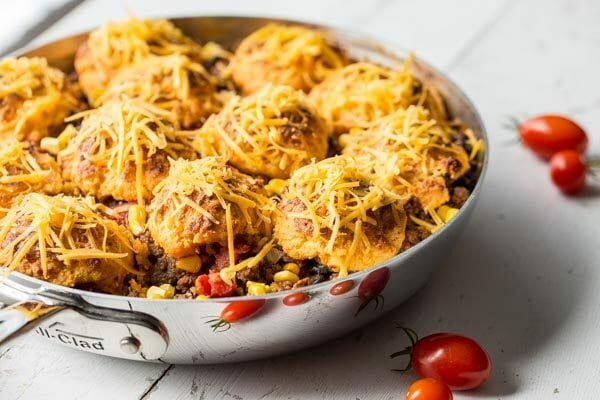 Here’s an easy dinner recipe for Skillet Taco Cobbler. 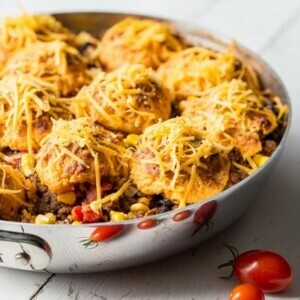 Ground beef, black beans, tomatoes and corn come together in a nicely spiced base for these tender, cheesy cornmeal biscuits. I’m a pushover when it comes to cobblers. Just the thought of something “cobbled” together gets my creative juices flowing. 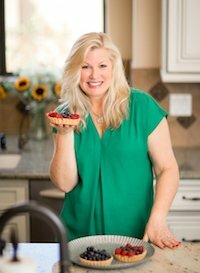 Sweet, savory or somewhere in between, cobblers are the answer for me when I need a one pan dish that covers all the bases. 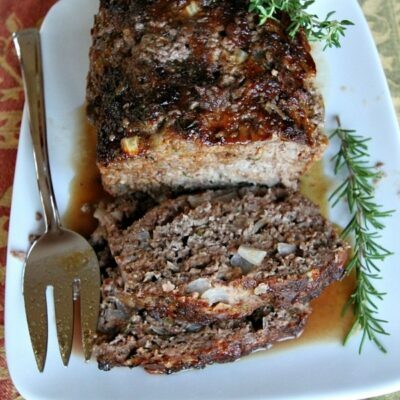 This recipe makes a great base “taco” meat that can be used for many delicious dishes. Think nachos, burritos, quesadillas and salads. 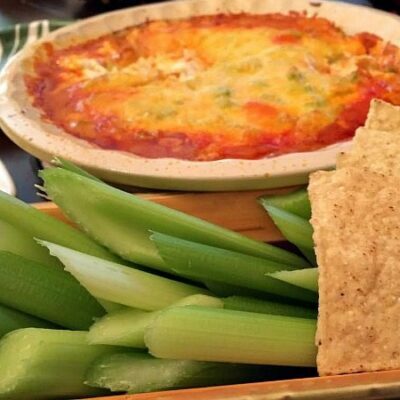 I highly recommend setting aside a cup or two of the taco meat to add to hot cheese dip or queso for your next party. The cheesy cornmeal biscuits couldn’t be easier to make and are absolutely terrific baked on top of the taco meat. The cornmeal biscuits are not at all soggy, and are the perfect compliment to this well spiced Mexican favorite. 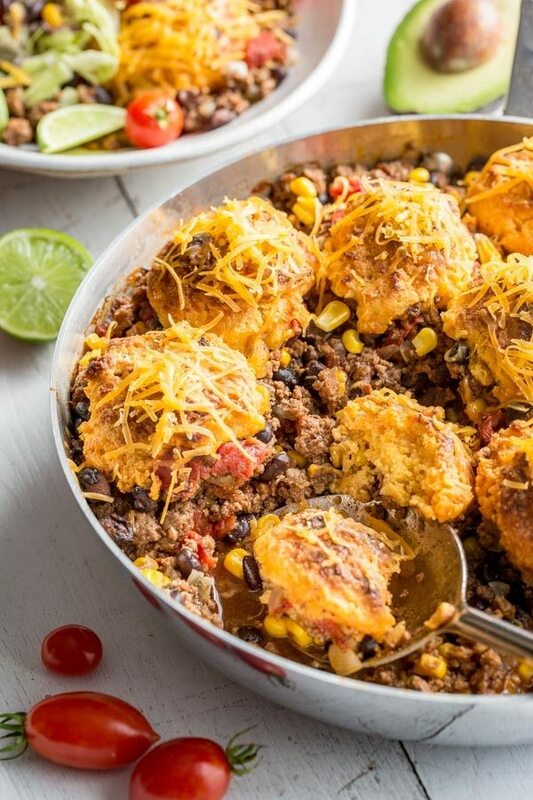 We love to top this Skillet Taco Cobbler with all the yummy extras. A good squeeze of fresh lime juice, diced avocado, fresh cherry or grape tomatoes, shredded lettuce, red onion and extra cheese are a few of our go-to add-ins. 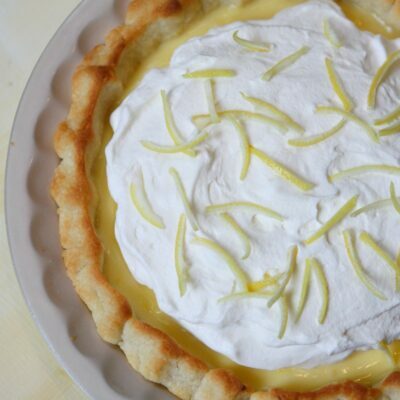 Make this once and I bet your family will ask for this easy weeknight meal, again and again! Combine the all the spices together in a small bowl (chili powder through Sriracha). Set aside. In a large ovenproof skillet, cook and crumble the ground beef until almost done. Drain off most of the fat leaving about 3 tablespoons. Add the diced onion and all the seasonings. Cook the mixture over medium-high heat for 3 to 4 minutes, stirring frequently. 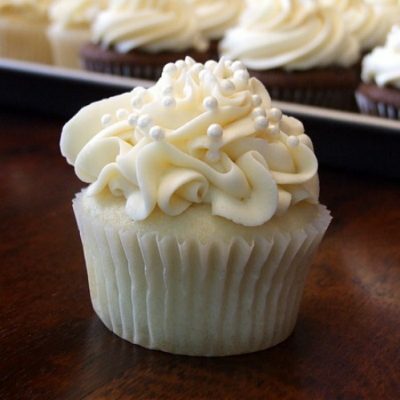 Combine the cornstarch with 1 cup of water, stirring until well blended. Pour the water mixture over the ground beef, and add the tomato paste. Bring to a simmer. Fold in the corn, black beans and fire roasted tomatoes. Turn the heat to low and keep the taco meat warm while preparing the biscuits. In a medium mixing bowl, whisk together the cornmeal, flour, baking powder, brown sugar, salt and Sriracha if using. Add the butter and work it into the cornmeal mixture using your fingers or a pastry blender, until crumbly. Using a spatula, gently fold in the buttermilk and 1/2 cup of the cheese until combined. Using an ice cream scoop, drop 12 mounds of the cornmeal dough on top of the taco meat, spacing them about an inch apart. 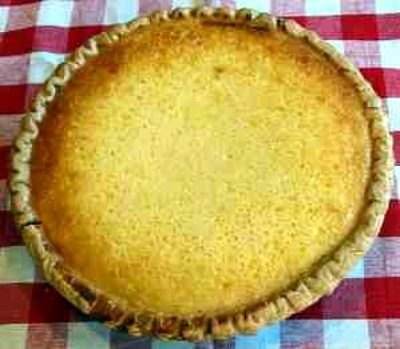 Place the skillet on a large rimmed baking sheet (in case it bubbles over) and bake for 25-30 minutes or until the filling is bubbling and the biscuits are golden brown. Remove from the oven and sprinkle with the remaining cheddar cheese. Allow the cobbler to rest 5 minutes before serving. 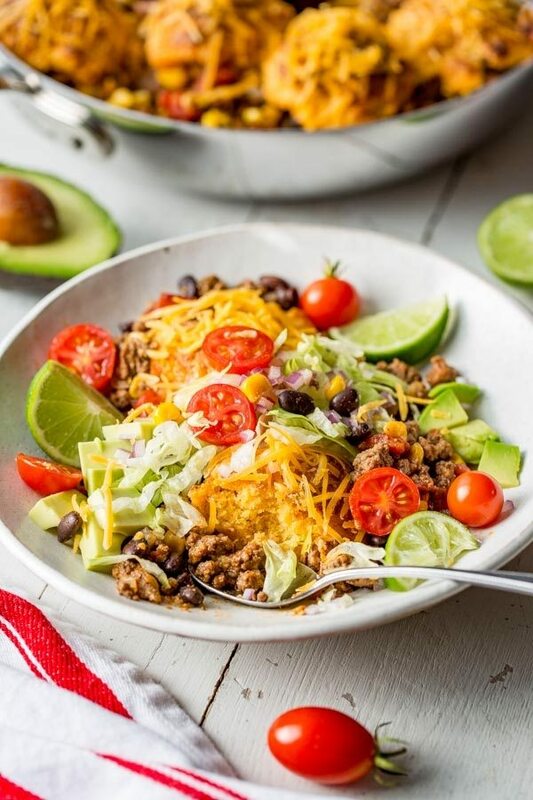 Serve in a bowl with your favorite taco toppings such as: shredded lettuce, cheese, queso dip, chopped red onion, fresh diced tomatoes, guacamole or avocado, cilantro, salsa, sour cream and bottled hot sauce. This is not a soupy or saucy filling. It is much drier than a bowl of chili. 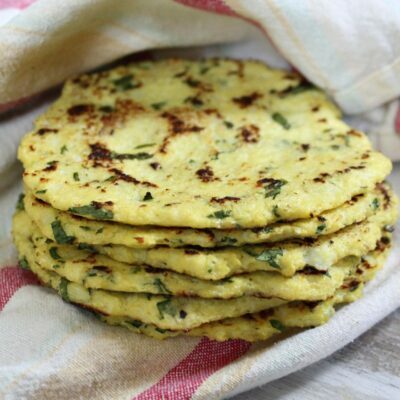 You can skip the cornmeal biscuits and use the beef, bean and corn mixture for tacos, burritos or salads. For a more saucy taco filling, add more tomato paste or a can of tomato sauce if desired. The ingredients reference “1 (14.5 oz) can fire roasted diced tomatoes, do not drain”; however, I do not see any reference in the directions as to when they should be added. Sorry about that Don, I fixed the recipe. The tomatoes are added at the same time as the black beans. Thanks for catching that, the recipe has been corrected.